DO I NEED PRIOR SEA KAYAKING EXPERIENCE? No previous kayaking experience is needed on most of our trips. Our trips are suitable for novice and experienced paddlers alike. Age is not a limiting factor Our guides will teach you efficient paddling techniques at the beginning of your trip, your technique will refine over the course of the trip and you’ll soon handle your kayak with confidence as you learn how simple paddling really is! Please note. Eskimo rolls are NOT a required skill. WHAT TYPE OF PHYSICAL SHAPE DO I NEED TO BE? Our trips are geared towards anyone in good health, with a sense of adventure and an appreciation for the outdoors. No special physical ability is needed. 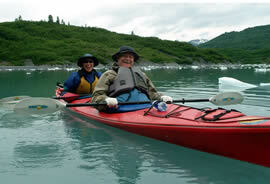 Kayaks are fairly comfortable and can accommodate a wide range of physical shapes. On the average, we paddle 4 to 6 hours a day with frequent stops for snacks, lunch and stretches. We plan our trips to take advantage of wind and currents but at times, conditions can make paddling a bit more challenging. Our guides job is to make sure that you never find yourself in a situation beyond your capabilities. In our 16 years of experience, no one has ever sustained an injury on any trip. Our primary concern while you are with us is your safety. WHAT QUALIFICATION DO YOUR GUIDES HAVE? Our guides are among the best to be found anywhere. They are experienced outdoor leaders have taken numerous courses including leadership course, advanced wilderness first aid and C.P.R. All are experts at interpreting cultural and natural history as well as comforting, safe, and fun to share a campfire with! they carry an extensive first-aid kit and two-way radios and flares. Our water-taxi stands by at all times, and is available for support in case of an emergency. 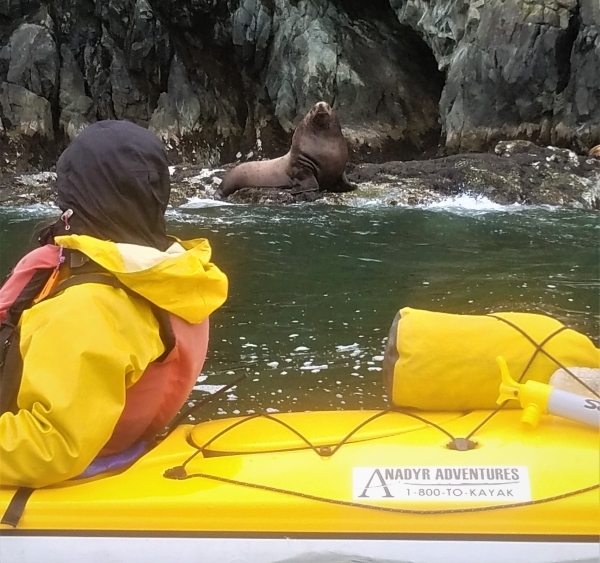 Yes, our trips operate in areas inhabited by many varieties of land mammals and sea life. 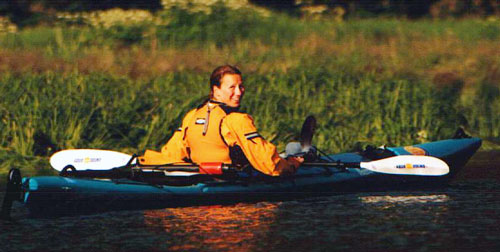 Paddling kayaks is a silent mode of transportation that often allows for intimate wildlife encounters. However, wild animals are unpredictable, and sightings vary from trip to trip. We believe our small group size allows people the best opportunity for wilderness encounters and good conversation. Our 2006 schedule of tours is based on small groups with a maximum of 8 for day trips and 8 for camping trips (accompanied by 2 guides). Mothership and lodge based tours can accommodate up to 6 guests. We can also provide private and custom trips on dates not listed in the schedule. Your traveling companions will be some of the most unique and interesting people anywhere. Our guests are active, involved people. Because both kayaks, wildlife, and an adventurous spirit bring them all here, you will find everyone in your group has common interests. We provide the friendly, supportive environment; you do the rest. The ages of most of our guests range from the mid-twenties through mid-fifties. Our minimum age limit is 6 on day trips, 12 on camping trips There is no upper age limit. No age limit is set on mothership and lodge based tours. WHAT TYPE OF MEALS DO YOU SERVE? For those who choose a fully guided and outfitted trip your guides will expertly prepare all your meals with menus developed to encompass a variety of mouth-watering flavors! We take pride in the taste, variety, and presentation of our meals. We use nothing but the best, providing fresh produce and fruits whenever available and select foods with no preservatives or additives. To start the day you will be enjoying a substantial North American breakfasts and freshly ground coffee, wholesome sandwiches, fresh salads and soup for lunch, tried and true international favorites for supper including fresh salmon or halibut when available In the event that you have special dietary requirements or food intolerances, please let us know in advance. We can accommodate to meat lovers as well as to vegetarians! WILL WE BE ABLE TO BATHE? We carry solar showers on request for warm showers. Near some camps are freshwater waterfalls and streams or secluded ocean spots for a brisk bath. There are hot showers on board the Mothership and at the lodge. I’M SINGLE, CAN I STILL JOIN A TRIP? Absolutely, many of our guests are singles. 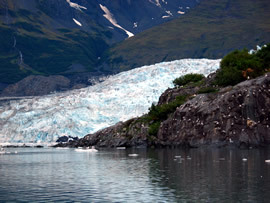 Our trips operate in Prince William Sound, Southcentral Alaska where we enjoy a cool and moist maritime climate. Summer temperatures usually range from the 50’s to the 70’s, although we have been known to withstand heat waves in the 80’s. May, June and early July tend to be dryer than late July, August and September. WHAT MONTH IS BEST TO TRAVEL? In Southcentral Alaska, May and June tend to be sunnier and dryer than August, although this varies from summer to summer. Each month is special. During June and July you will experience longer daylight hours due to the summer solstice. On some trips, the sun hardly sets. July and August are wetter but also the best months for observing bears feeding on salmon, berrypicking, whale watching and salmon fishing. No matter what month of the year you travel, you will enjoy your adventure. Proper clothing is essential. Once you book with Anadyr Adventures you will receive a a packet of information with a list of clothing appropriate for the trip you signed up for. WILL I GET EATEN BY BUGS? Bugs usually are not a problem while paddling. In camp we recommend head nets or bug dope. On all camping trips our guides carry a group cooking tent made of noseeum screen which will protect you from bugs during dinner and while you relax in camp. Our multiple day camping trips are designed for children over the age of 12. However, we have successfully taken families with children as young as eight years old with prior camping experience. Our new for 2007 Base Camp option is particularly good for families with younger children. 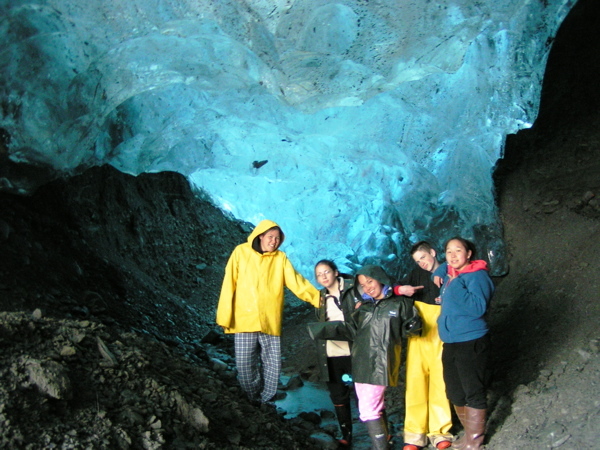 Half day trips and Shoup Glacier day trips are suitable for children 6 and over. Mothership and lodge based trips are excellent choices for families with younger kids. Yes, most overnight trips offer fishing opportunities. You will need to purchase an Alaska fishing license, bring your own gear, and be prepared to share your catch at dinner! 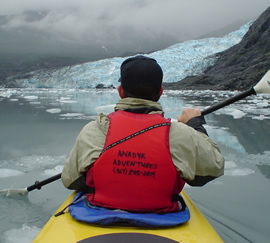 Anadyr Adventures provides all your kayaking and safety equipment. We use nothing but the best. We maintain a fleet of stable single and double kayaks equipped with rudder steering for ease of operation, spray skirts, life jackets, paddles, dry bags, bulkheads and rubber boots for on shore activities. Our fleet includes: Necky, Current Design, Northwest, Perception and Seda kayaks. On fully outfitted camping trips we also provide: cooking and eating utensils, group tarps, and tents. All group equipment is of the highest standard, well maintained and checked prior to every trip. Yes, when your guides did a good job please tip them. Show your guides that you appreciate their work. Normally guides get beeween 10-20% of total trip price. For overnight trips you need to arrive the evening before for a pre-trip meeting. 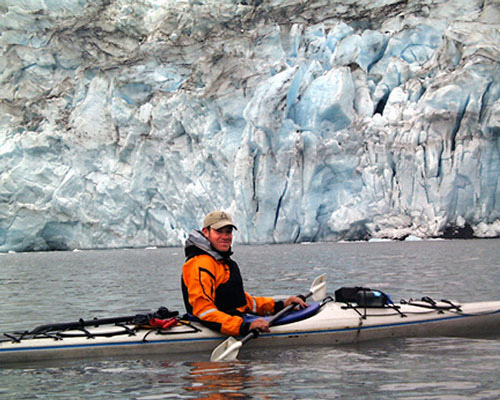 Anadyr Adventures would be more that happy to help you plan your sea kayaking adventure! Please contact us with any questions you may have and for additional information.